Robert J. Phillips has been practicing since 1978 in areas of insurance defense or all kinds, including coverage opinions, coverage litigation and bad faith defense. 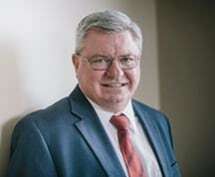 He has tried numerous civil jury trials in various areas, including automobile, trucking, railroad, products liability, professional liability, construction defect and insurance bad faith, in State, Federal and Tribal courts. He has been lead counsel in many of the leading cases in Montana insurance law before the Montana Supreme Court, Federal Court for the District of Montana and the Ninth U.S. Circuit Court of Appeals. He has also been lead counsel before the U.S. Claims Court, Federal U.S. Circuit Court of Appeals and the U.S. Supreme Court. Professional memberships include State Bar of Montana (admitted 1978, President 1994-1995), Western Montana Bar Association (President 1986-1987), American Bar Association, Montana Defense Trial Lawyers Association, American Board of Trial Advocates (President, Montana Chapter, 2004-2006, National Board Member , 2008-2011), Defense Research Institute and the International Association of Defense Counsel. He holds the highest rating available in the Martindale-Hubble Law Directory, and is listed in A.M. Best Recommended Insurance Attorneys and Super Lawyers. His civic involvement includes Community Medical Center, ( Director, 1998-2015, Chair 2005-2009), Salvation Army Board of Directors, Planned Parenthood of Montana Board of Directors, Planned Parenthood Federation of America, (Vice Chair 1992-1994), Missoula Children's Theatre and United Way of Missoula. He currently chairs the Missoula Community Hospital Legacy Foundation, one of the largest health-related foundations in the State of Montana. 80% Insurance defense , Coverage , Professional Liability defense etc.